The Kindle Oasis was Amazon’s top-of-the-line ebook reader when it debuted in 2016. We really enjoyed reading books on the 2016 Kindle Oasis and in our review, we stated that price aside, it’s about as good a reading experience as you can get. Amazon has now refreshed the Kindle Oasis by adding a larger screen and making it waterproof. Does that make it a better device? We used it for two weeks to find out. First up, the bad news — the Kindle Oasis no longer ships with a charging cover. This was one of our favourite features of the 2016 Kindle Oasis, but Amazon has decided to do away with it. The 2016 Oasis was really compact and the charging cover gave it lots of extra battery power. The new Oasis is bigger and bulkier, and that allows room for a longer lasting battery. You’ll now have to buy a cover separately. Ergonomically, we prefer the 2016 Oasis over the new one. The large screen on the new Oasis is obviously a plus, but it comes at the cost of comfort — we didn’t find it as easy to read on for hours at a stretch. The new Kindle Oasis is now waterproof, but it has a slippery back and we nearly dropped it quite a few times because of that. There’s a ridge at the back so its thickness is uneven. The 2016 Oasis masks this neatly with the charging case, but this year the lack of a case highlights it. Amazon wants you to use the ridge as a grip to hold the Kindle with, but because it is so slippery, it’s not an effective design choice. The new Kindle Oasis is also heavier and we found ourselves moving it from one hand to the other once every 20 minutes or so. Kindle Oasis (2016) on the left and Kindle Oasis (2017) on the right. A Kindle Paperwhite is hanging out towards the top. The Kindle Oasis (2017) has a large 7-inch display, which is one of the best screens you’ll find on an ebook reader today. Text is crisp and you won’t have any complaints when reading in the daytime. There’s an adaptive frontlight which illuminates the display when you’re reading in the dark. It works fine and didn’t strain our eyes much even after three hours of nonstop reading late at night. However, the auto-brightness feature is a bit too aggressive and we found that the intensity of the frontlight was constantly increasing and decreasing. This began to distract us from our books and we just disabled the auto-brightness feature entirely, and stuck to manually changing it as and when needed. The new Kindle Oasis retains the two page-turn buttons of its predecessor, and they work just as well. When you rotate the Kindle Oasis to hold it in a different hand, the book rotates automatically. This means that you can flip pages using the two buttons no matter which hand you’re holding the Kindle with. These buttons are housed near the edge of a generous bezel; a neat way to ensure that you’ll never accidentally hit the screen when you want to turn the page. The 2017 Kindle Oasis’s screen truly highlights why this device is the top ebook reader in Amazon’s lineup. 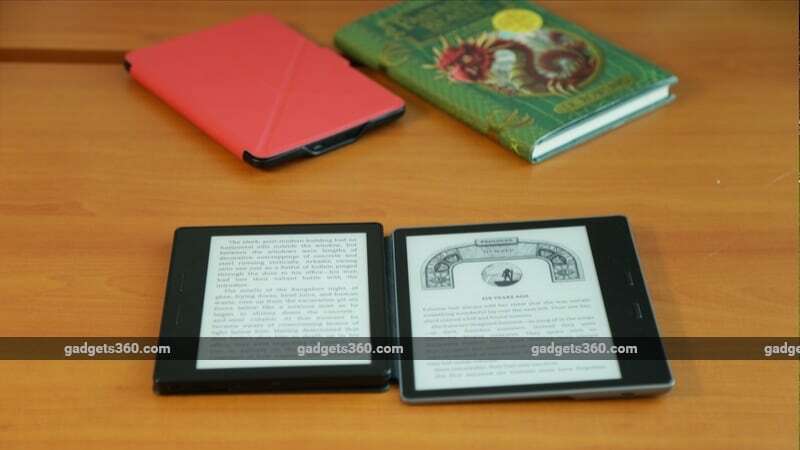 The screen is flush with the device’s front, unlike the Kindle Paperwhite, where the display is slightly lower than its thick bezels. On the Oasis, the bezel is thick on the side with the ridge that you’ll use to hold the unit, and slim everywhere else. During the initial years, one of the limitations of e-ink displays used to be that they were a bit slow when it comes to refreshing pages. The minor lag that you used to see when going from one page to the next is now almost completely gone across the Kindle lineup. The Kindle Oasis’ screen responds almost instantly when you turn pages, and this makes a big difference to the reading experience. There are a few new fonts called Amazon Ember and Amazon Ember Bold, in case you weren’t happy with the Kindle’s limited font choice, but for us the clarity of the display and the improved page refresh makes a much bigger difference than font choices. During our testing, the 1,243-page epic Oathbringer by Brandon Sanderson was one of the books we read. When you’re going through a book that long, the quick page turns make a massive difference and using the dedicated page turn buttons is a lot smoother than tapping the touchscreen. Another advantage of the larger screen is the ability to appreciate graphics, such as the maps that you sometimes need to refer to in fantasy novels. When we started using the Kindle Oasis, its battery life was around the 75 percent mark. After two weeks of regular reading — often with the frontlight enabled – the battery was almost completely drained. We think this is pretty good battery life. The Kindle Oasis charges through the same Micro-USB port that all other Kindle devices sold so far have been using. One would imagine that a switch to USB Type-C is due at some point, but at the moment we don’t see this as a big deal. One big new feature of the 2017 Kindle Oasis is that it’s waterproof. The Kindle Oasis is IPX8 rated, which means that it’s supposed to be waterproof when submerged up to 2m deep in water for up to one hour. You can head to this page to check what you need to do to dry the Kindle if it gets wet, and what conditions are unsafe to use it in (such as steam rooms). We tested our Kindle Oasis under a shower and by immersing it in a bucket of water. Under the shower, water droplets kept triggering the touchscreen and somehow changing the font size. We didn’t actually try reading when the Kindle Oasis was in a bucket of water, but it survived the experience. If someone splashes water on the Oasis, or if you accidentally drop it in water, it shouldn’t die. We never really read while sitting by a pool or and we can’t imagine needing to use a Kindle when walking outside in the rain, but if you wish to do these things, you no longer need to worry. Waterproofing is a really useful feature to have overall, and we hope that it will eventually make it to more affordable Kindle devices too. The Kindle Oasis supports audiobooks, and the more expensive 3G variant has 32GB of built-in storage, as opposed to 8GB on the Wi-Fi variant (the one we reviewed). Audible, Amazon’s audiobook service, isn’t officially available in India yet so we didn’t get a chance to test it. However, it’s important to note that you’ll need a pair of Bluetooth headphones or speakers to listen to audiobooks since there’s no 3.5mm audio jack or built-in speaker. Overall, we’re quite pleased with the new Kindle Oasis but, personally, we didn’t like it as much as the original. We feel that it could have been designed better in terms of the grip and the rear texture, and the lack of a case feels like a downgrade. If the large screen and a waterproofing appeal to you, the new Kindle Oasis is a good buy. It costs Rs. 21,999 for the 8GB Wi-Fi version and Rs. 28,999 for the 32GB 3G one. If you’re buying an ebook reader at this price, then clearly budget is no bar and you’re getting the best of what Amazon has to offer. For those on a more modest budget, we still think the Kindle Paperwhite is a fantastic ebook reader. It will be more than enough for most people, and now the differences between the Paperwhite and Oasis are even more pronounced.